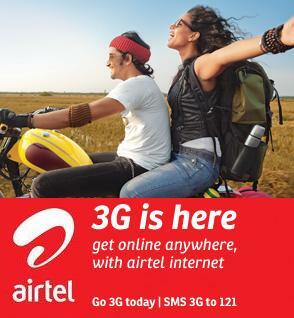 Bharti Airtel launched 3G services in another major metro city of India - "Kolkata". More than 3.6 million Airtel customers can use 3G services in Kolkata , customers can experience and enjoy fast mobile internet access, Mobile TV, video calling, video streaming and social networking. Airtel 3G services started for customers in Kolkata started from midnight on 4 August 2011. On this launch of 3G services, PD Sarma, chief executive officer, West Bengal & Orissa, mobile services, Bharti Airtel, said, "Having successfully launched Airtel 3G services in 50 plus towns across India, we today have over 3 million customers enjoying the Airtel 3G advantage and are delighted to extend this incredible experience to our customers in Kolkata — the city of joy." PD Sarma added, "Given the increasing propensity of customers in West Bengal towards using accessing more and more information through mobile internet, we are confident that 3G will emerge as a game changer that will redefine the way our customers access data services to stay closer to their passion for art, music and other forms of entertainment." To know more or join Airtel 3G services - customers can visit www.airtel.in/Airtel3G/ or call 12134 (toll free) or SMS '3G HELP' to 121.